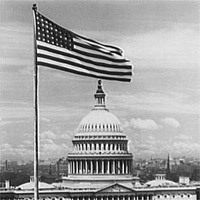 On April 12, 1818, a new flag flew over the U.S. Capitol for the first time. The number of stars and stripes on the American flag had already changed twice because the country was growing rapidly. The first national flag had 13 stripes and 13 stars, one star and one stripe for each state. In 1795, when Kentucky and Vermont entered the union, new flags had to be made with 15 stars and 15 stripes. In 1818, five more states joined the union with the prospect of more. Could you imagine the flag now with a dizzying 50 stripes as well as stars? CREDIT: Theodor Horydczak, photographer. "U.S. Capitol exteriors. Flag and east front of U.S. Capitol." ca. 1920-ca. 1950. Washington as It Was: Photographs by Theodor Horydczak, 1923-1959, Library of Congress. AUDIO CREDIT: Blon, Franz von. "True to the flag march / F. von Blon; [performed by] United States Marine Band." Edison, 1922. Inventing Entertainment: The Motion Pictures and Sound Recordings of the Edison Companies, Library of Congress.